If you love books, you probably have dreamed of having your own library in your home. Not many people have an extra room handy to designate just for this purpose, though. The good news is that it doesn’t have to take up a whole room. 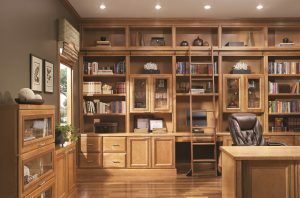 You can start your collection by having home library cabinets installed in a corner or nook of your home. When you point out an area and everyone in the family starts getting excited about it, you know you’ve found the right location. Then you can start to plan the specifics. Professional design consultants are well-equipped to help you maximize the space you’ve chosen. Work with your designer to figure out where the home library cabinets are going to go and how many of them you need. The designer can also help you choose a material for your shelves that works well in the space while still staying within your budget. Adding decorative touches such as complementary crown molding or trim can make the shelving look like it was part of the original plan of the house. Once you have a space for your books, you can make the area cozier and more inviting. A nice armchair or two provide a comfortable place to sit and read. Adjustable lamps help you make the lighting just right. You may also consider throw pillows, blankets, an ottoman and a small table for drinks or snacks. Make the space exactly what you want it to be. You don’t have to clear out a whole room or build an extra one onto your home to make your dream of having a library come true. Adding home library cabinets to a small corner of your home can be just as dreamy for you and your family.